Sky is sitting at the kitchen table. The pan of chips continues to bubble and sizzle on the stove. Toby is with his friend, Ben, in a telephone box, telling him that he'll have to call to make sure it's OK to go over to Ben's place – and he wants to see what happened to his dad in court. Ben asks excitedly if he robbed a bank! TOBY: I wonder where grandma is. At the counter, Ryan orders his lunch from Gemma, and, as she prepares it, asks how things are going. Gemma explains that she's got two jobs now: she's doing telephone sales, selling pre- packaged wines in her spare time. Dorothy comes in and asks Ryan what time she can expect him for dinner. Ryan just replies coolly that he's still got some work to do for Joe. Dorothy shrugs that if he's not too late, she'll wait for him. She heads out again, leaving Ryan to explain to Gemma that his Aunt lets everyone think she's a widow, but he's found out Uncle Colin isn't dead. He adds that he wants to help, but doesn't know how. Across at a table, Joe is sitting with Harold and Stephen Evans. Joe demands to know what the score is in court: he's going to be made out to be a lousy father, isn't he? Evans tells him that the Judge will know what the Jensens are up to: Joe just has to stay confident, cool and honest. With that, he heads out. 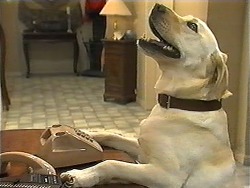 Harold goes to call Madge, but he finds the ‘phone engaged and comments that Madge must be having a real old natter. 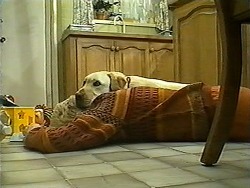 The chip pan suddenly catches fire as Bouncer paws over Madge, trying to rouse her. He starts barking. 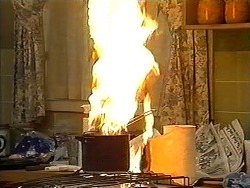 The fire in the pan spreads to a role of kitchen paper. All of a sudden, the back door opens and Toby walks in. Seeing what's going on, he grabs a blanket and throws it over the fire, before turning off the gas. He then tries to get Madge to wake up. As she closes up the shop, Gemma complains to Matt that she has no time to sell her wine; but she suddenly realises that she could use the ‘phone at the Coffee Shop when it's quiet. Matt warns her that Harold's not going to like it. Gemma, however, retorts that she's doing Harold a favour by working there; he'll understand. Matt doesn't look convinced. 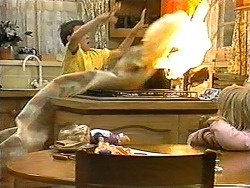 TOBY: The whole house could have burnt down, dad! Madge insists that she's as tough as old boots. Toby explains that Bouncer's a hero: he answered the ‘phone and he knew something was wrong! The next morning, Helen opens the front door to Dorothy and asks what she can do for her. Dorothy explains that neither Todd nor Cody was at school yesterday. Helen murmurs that they've disappeared: it seems that they ran off together. Dorothy asks why they would do such a thing. Helen replies that Todd has had a few hassles lately and they've obviously upset him more than they realised. She adds that Doug Willis has gone to look for them and Jim has filed a report with Missing Persons. Dorothy offers to make a few discreet enquiries amongst the ‘little darlings' at school. TOBY: You look like a real yuppie, dad! Joe picks up Sky and cuddles her, telling her that there's no way they're going to take her away. GEMMA: Oh, Matt, I think I'm in trouble here. 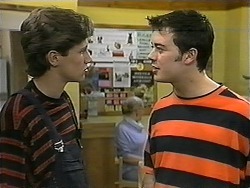 MR. LEWIS: Mr. Mangel, do you love your son, Toby? JOE (nods): Yes, of course I do. MR. LEWIS: And did you walk out on that son and your first wife, Noelene, when Toby was eighteen months old – not much younger than Sky? MR. LEWIS (curtly): Yes or no, Mr. Mangel. Did you walk out or didn't you? 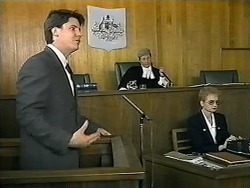 MR. LEWIS: And is it true that you paid no maintenance whatsoever to Toby and Noelene for five years? JUDGE LATIMER (interjects): No it's not true, or no you didn't? JOE (admits): No, I didn't, Your Honour. Mr. Lewis goes on that when Joe *did* take custody of Toby, it was only on a short- term basis, was it not? Joe just stands there, looking downcast. MR. LEWIS: Yes, but strictly speaking, you're not even qualified to do *that*, are you? MR. LEWIS: Thank you, Mr. Mangel. That's all. The Judge tells Joe that he can step down. Sometime later, Mr. Lewis is summing up, telling the Judge that the crucial factor in these deliberations *must* be the child. 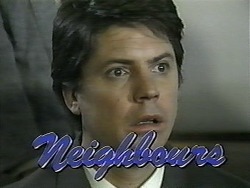 He goes on that Mr. Mangel is not in a strong financial position and his work history over the past five years is erratic; he's also a single parent, whereas his client, Eric Jensen, is married and able to offer Sky two loving parents; and Eric is Sky's natural father. 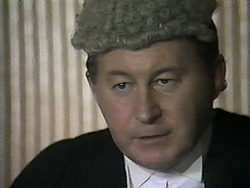 He goes on that in these circumstances, he submits that there is only one judgement His Honour can make. EVANS: Being a parent has changed Joe Mangel. He is a man who has confronted a challenge and grown as a human being. He is a good man and a good parent to Sky. Though he may have changed jobs, there's always been bread on the table, and Sky has never wanted for care, affection or love. Their family is a tight, warm, happy unit, and Sky is an integral part of that unit. Judge Latimer announces that he'll consider this matter over the luncheon adjournment and give his judgement when they return. The Court Officer tells everyone to stand and that the court is adjourned and will resume at two o'clock. RYAN: Did he break the law? Dorothy asks in astonishment what's behind *this* particular line of questioning. Ryan admits that he found a letter behind her wedding photo; he didn't read all of it, but his Uncle Colin said he loved her. Dorothy snaps that he had no right to read *any* of it. Ryan just comments that some of it was cut out with scissors, and that's what wardens do in prisons, isn't it? Dorothy just growls at him to leave it alone; if he keeps snooping, he'll turn up things he'll wish he hadn't. Matt is serving customers while Gemma continues to sell wine on the ‘phone. When she hangs up, she smiles at him that he's a terrific guy! He just replies that he has to go. Gemma thanks him for his help – but then admits that she was wrong about being able to do two jobs. At that moment, Madge comes in and asks Gemma what's going on. Gemma explains that she's been selling her wine. Madge exclaims in astonishment that Harold is paying her to *work* there; she can't go selling her wine, and the Coffee Shop isn't licensed premises – Harold is going to have an absolute fit if he finds out about this. JUDGE LATIMER: Cases such as this are always difficult. 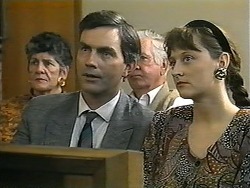 Each side has presented persuasive argument… But it's also been pointed out that Mr. Mangel has a somewhat chequered working history and his current business has not been long in operation… I'm impressed by Mr. Mangel's obvious efforts to consolidate his life, and his love and dedication to these two children. However, these reports [he indicates some papers] also indicate that bonding between Sky and Mr. and Mrs. Jensen is also proceeding very well… In these circumstances, I find the argument for custody by the natural parent to be most persuasive. I therefore make orders giving custody of Sky to Mr. and Mrs. Eric Jensen. The Jensens let out an exclamation of delight. 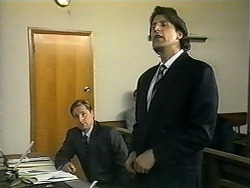 Joe just stares at Judge Latimer in horrified disbelief.